1. Girts — "Z" or "C" shaped girts, 0.056 to 0.120 in. thick steel, 6 to 12 in. deep, with 2 to 4 in. wide flanges. Girts placed horizontally (with flanges up or down) and spaced max 48 in. OC. Girts are secured to columns with girt clips, Item 2, or bolted to the column through the girt flange. 2. Girt Clips — (not shown) — Steel secured to column by welds or bolts. 3. Steel Wall Panels — Min No. 26 MSG, min 16 in. wide coated steel panels. Panel joints offset 6 in. from gypsum sheathing joints. If one layer of exterior wallboard is used, panels are fastened to the horizontal girts with 1-1/2 in. (min) long No. 12-14 self-drilling screws 12 in. OC. If two layers of exterior wallboard are used, panels are fastened to the horizontal girts with 2 in. (min) long No. 12-14 self-drilling screws 12 in. OC. Vertical raised rib profiles of adjacent panels are overlapped approximately 3 in. and attached to each other with 7/8 in. long 1/4-14 (min) self-drilling screws (stitch screws) 24 in. OC (max) along the lap. 3A. Steel Siding or Brick — (Optional, not shown) For Fire Resistance Ratings from inside of wall only, steel siding or brick veneer meeting the requirements of local code agencies, may be installed over additional furring channels (not shown), Item 4, on exterior of wall in place of steel wall panels. Brick veneer attached to furring channels with corrugated metal wall ties attached to each furring channel with steel screws, not more than each sixth course of brick. When a minimum 3-3/4 in. thick brick veneer facing is used, the fire resistance rating applies from either side of the wall. 4. Furring Channels — Hat shaped, minimum 25 MSG galv steel, approximately 2-5/8 in wide, 7/8 in. deep, spaced 24 in. OC perpendicular to girts. Channels are secured to each girt with 3/8 in. (min) long self-drilling pan head sheet steel type screws. Two screws are used at each fastening location, one through each leg of the furring channel. 5. Gypsum Board* — Any 1/2 in. thick UL Classified Gypsum Board that is eligible for use in Design No. X515. Any 5/8 in. thick UL Classified Gypsum Board that is eligible for use in Design Nos. L501, G512 or U305. See table under Item 6 for number of layers and thickness on interior face of wall. Any 5/8 in. or 1/2 in. thick gypsum board applied horizontally or vertically. First layer attached to furring channels, Item 4, using 1 in. long Type S bugle head gypsum board screws spaced 24 in. OC. vertically and horizontally. Second layer attached to furring channels using 1-5/8 in. long Type S bugle head gypsum board screws spaced 12 in. OC. vertically and 24 in. OC. horizontally. Third layer, when used, attached to furring channels using Type S bugle head gypsum board screws spaced 12 in. OC. vertically and 24 in. OC. horizontally, 1-7/8 in. long for 1/2 in. gypsum board and 2-1/4 in. long for 5/8 in. gypsum board. Fourth layer, when used, attached to steel strapping using 1 in. long (min) bugle head drywall screws spaced 8 in. OC. Steel strapping from flat stock, 1-1/2 in. wide, fabricated from 0.020 in. thick (25 gauge) galv steel. Steel strapping located vertically and attached to third layer of gypsum board at each vertical joint and intermediate stud using 2-5/8 in. Type S bugle head drywall screws 12 in. OC. The horizontal or vertical joints of the wallboard are offset 24 in. when 2 successive layers are applied in the same orientation. 5A. Gypsum Board* — (As an alternate to Item 5) - Fastened as described in Item 5. 5/8 in. thick, 4 ft. wide, paper surfaced, applied vertically only. 5B. Gypsum Board* — (As an alternate to Items 5 and 5A) — Nominal 5/8 in. thick, 4 ft wide panels, applied vertically only and secured as described in Item 5. 5C. Wall and Partition Facings and Accessories* — (As an alternate to Items 5 through 5C) — Nominal 5/8 in. thick, 4 ft wide panels, applied vertically only and secured as described in Item 5. 5D. Gypsum Board* — (As an alternate to 5/8 in. Type FSW in Item 5) - Nom. 5/16 in. thick gypsum panels applied vertically or horizontally. Two layers of 5/16 in. for every single layer of 5/8 in. gypsum board described in Item 5. Horizontal joints on the same side need not be staggered. Inner layer of each double 5/16 in. layer attached with fasteners, as described in item 5, spaced 24 in. OC. Outer layer of each double 5/16 in. layer attached per Item 5. 6. Gypsum Board* — See following table for number of layers on exterior face of wall. Any exterior grade 5/8 in thick gypsum wallboard or gypsum sheathing applied horizontally or vertically. First layer attached to girts, Item 1, using 1-1/4 in. long (min) self-drilling bugle-head sheet steel type gypsum board screws spaced 8 in. OC. horizontally. Second layer, when used, attached to girts using 1-5/8 in. long (min) self-drilling bugle-head sheet steel type gypsum board screws spaced 8 in. OC horizontally. The horizontal or vertical joints of the gypsum board are offset 24 in. if 2 successive layers are applied in the same orientation. Any 1/2 in. thick UL Classified Gypsum Board that is eligible for use in Design No. X515. Any 5/8 in. thick UL Classified Gypsum Board that is eligible for use in Design Nos. L501, G512 or U305. See Gypsum Board (CKNX) category for names of Classified companies. 7. 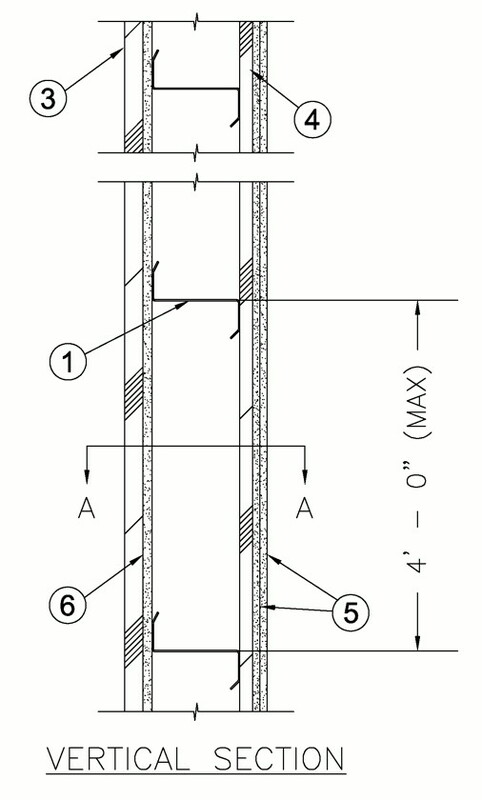 Column Protection — (not shown) — Horizontal wall girts, Item 1, are attached to vertical structural steel columns. See Column Design Nos. X524 and X530 for protection of columns. 8. Batts and Blankets* — (optional, not shown) — Glass Fiber Batts placed in the cavities of exterior walls. See Batts and Blankets* (BZJZ) — category for names of manufacturers. 8A. Fiber, Sprayed* — As an alternate to Batts and Blankets (Item 8) — (100% Borate Formulation) — Spray applied cellulose material. The fiber is applied with water to completely fill the enclosed cavity in accordance with the application instructions supplied with the product with a nominal dry density of 2.7 lb/ft3. Alternate Application Method: The fiber is applied without water or adhesive at a nominal dry density of 3.5 lb/ft3, in accordance with the application instructions supplied with the product. 8B. Fiber, Sprayed* — As an alternate to Batts and Blankets (Item 8) and Item 8A - Spray applied cellulose insulation material. The fiber is applied with water to interior surfaces in accordance with the application instructions supplied with the product. Applied to completely fill the enclosed cavity. Minimum dry density of 4.3 pounds per cubic ft.
8C. Fiber, Sprayed* — As an alternate to Batts and Blankets (Item 8) - Spray applied cellulose fiber. The fiber is applied with water to completely fill the enclosed cavity in accordance with the application instructions supplied with the product. The minimum dry density shall be 4.30 lbs/ft3. 9. Joint Tape and Compound — (not shown, optional) — Vinyl or casein, dry or premixed joint compound applied in two coats to joints and screw heads of face layer of gypsum board. Paper or glass fiber tape embedded in first layer of compound over all joints.